Sydney - Alex Doolan stroked his highest first class score as Australia A's middle-order coped comfortably with South Africa's pace attack and moved into a 352-run first innings lead by the close of the second day of their match on Saturday. Doolan was on 161 not out when captain Andrew McDonald declared Australia A's first innings closed at 480 for seven after lunch, as the visitors toiled on the slow-paced wicket at the Sydney Cricket Ground. The Proteas were 128 for one at the close of play, with Hashim Amla (27) and JP Duminy (two) together after Alviro Petersen was the only South African wicket to fall. Petersen went after mis-timing a sweep shot from spinner Glenn Maxwell and Nathan Coulter-Nile took the catch, dismissing the opener for a patient 38 from 108 balls. South Africa captain Graeme Smith had retired on 60 to give other players in the side some valuable time in the middle as his side build up for their first Test match against Australia at the Gabba on November 9. Doolan and several other of the second-tier Australian side's middle order made a mockery of reputedly the best pace attack in world cricket with the Tasmanian 26-year-old combining with Maxwell (64) and wicketkeeper Tim Paine (60) for 133 and 152-run partnerships respectively. Australia A had begun the day on 325 for seven, with Doolan on 76 and Paine on one and proceeded to keep the South Africans in the field until well into the fifth session of the match as Doolan scored his fifth first-class century and surpassed his previous high score of 149. 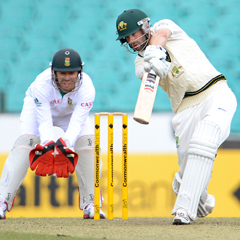 Opening batsman Rob Quiney (85) and Steve Smith (67) had both scored half centuries on the first day. The world's top ranked bowler Dale Steyn was the pick of the South African attack, finishing with three for 54 from 22 overs as he continually troubled the Australian A batsmen. Steyn's fellow fast bowler Vernon Philander finished with a poor return of none for 88 for 21 overs, while leg-spinner Imran Tahir was expensive in finishing with two for 157 from 40 overs.